The Caring Team, a dedicated group of congregants who respond to needs within the congregation and beyond, prepares and delivers sack lunches once a month for the Upper Room Homeless Shelter. Our congregational Safenet Project buys holiday gifts for women and children who are in temporary housing to escape domestic violence as well as donating to year round personal needs. 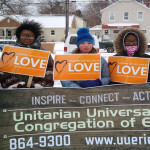 The Teen RE program’s social justice efforts included Standing on the Side of Love activities. 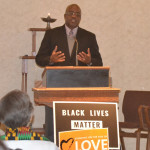 Local Erie Activist Marcus Atkinson gave a talk on Black Lives Matter. Later the teens participated in their first ever Martin Luther King Jr. march which was followed by a luncheon event at Gannon University. They were joined by the adults in the congregation who attend the march annually. Teens have also studied Eboo Patel, Founder and President of the Interfaith Youth Core. 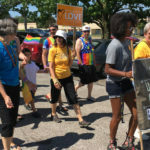 The Inspire Team participates in the Annual Gay Pride Parade and Pride Picnic. In past years, with all viewpoints receiving due consideration, our congregation took public stands supporting same-gender marriage, and advocating a moratorium on capital punishment. As well, for the sake of racial justice and alleviating mass incarceration which adversely impacts families, our Congregation is urging Erie City Council to enact appropriate legislation decriminalizing small amounts of marijuana for non-medical, personal use.